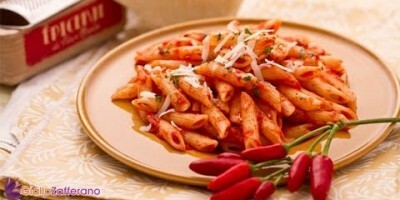 Penne Arrabbiata or Angry Penne is a quick and easy dish to make. The ingredients are few and most people have them on hand in their pantry. Whether you’re craving this dish and plan to make it or you’re not sure what to make, it’s always a popular choice. • 14 ounces (400 g) of penne — the ridged variety is best. In this pan I’ve put the oil and added the chopped garlic and chillies. Let them sauté for about a minute and after add the tinned tomatoes. I’ve chopped these up, but you can also put them in the food processor. Leave the tomatoes to simmer and absorb the flavours of the chilli and garlic and when it’s reduced a bit we can immediately add the pasta because the sauce will finish in the time it takes to cook the pasta al dente. The pasta is al dente. Now, drain the penne and in the meantime add the parsley to the sauce. Mix it together and then add the pasta. Now all you need to do is to mix it together and serve. Here’s our lovely plate of penne arrabbiata. All that’s left is to sprinkle with a bit of leftover fresh parsley and the grated pecorino and we’re finished.